This is a self-portrait figurine of Anna Pavlova, one of the most famous ballerinas of all time, who became an accomplished sculptress and produced several figurines of herself in various roles. She spent some time at the studio of the German sculptor Professor Lederer who persuaded her to let a German factory in Thuringia fire her work in porcelain. It shows her dancing the Dragonfly solo, one of the brief solos she created for herself evoking nature. Born in St Petersburg in 1881, Pavlova trained at the Imperial Theatre School but by 1906 she was associated with the revolutionary ideas of Mikhail Fokine, who choreographed the famous Dying Swan for her. In 1909 she danced with Diaghilev’s group in Paris, featuring on the poster advertising the season. In 1910 she made her first appearance in London and in 1912 performed in the first Royal Variety Performance. She formed her own company in 1913 and made ballet a world-popular entertainment, touring the world more than any other dancer before the days of air travel. Worn out by touring and the stress of performing she died of pneumonia in 1931, aged 51. According to legend, her last words were to her dresser, telling her to get her Dying Swan costume ready. 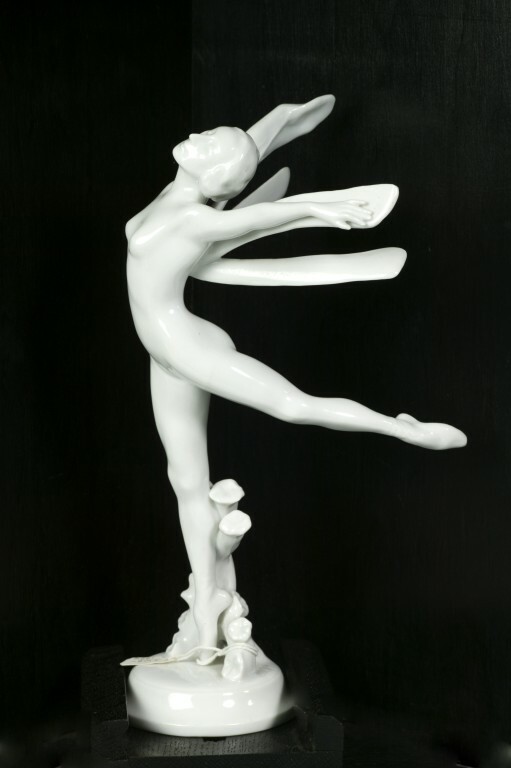 Glazed porcelain self-portrait figurine of Anna Pavlova as the Dragonfly, fixed in a wooden corner display case. She is posed on point on her right leg, her left leg raised behind her and her arms outstretched behind her. The initials A.P. 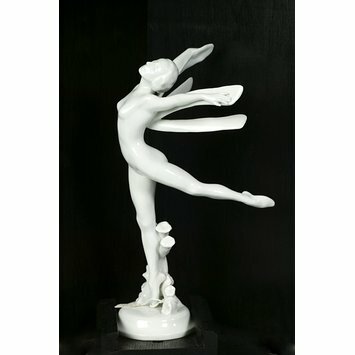 for Anna Pavlova, are incised on the base. Self-portrait figurine of Anna Pavlova (1881-1931) as The Dragonfly. Glazed porcelain, Thuringian, ca. 1920.